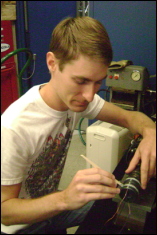 University of Maryland Aerospace Engineering graduate student, Andrew Becnel, was awarded a prestigious National Defense Science and Engineering Graduate Fellowship to support three years of Ph.D. research. His proposal, Crew Protection Strategies for Manned Spacecraft During Launch and Landing, was selected by the Air Force Office of Scientific Research from among more than 2,000 competitive applications in diverse fields of interest to the Department of Defense. Becnel earned his B.S. in Mechanical Engineering at the Louisiana State University, where he was their top graduate, earning the Tau Beta Pi Senior of the Year (2008), and graduating with Mechanical Engineering Honors. While an undergraduate student, he was the holder of a National Merit Scholarship (2003-2007), a Centennial Scholarship (2003-2007) and Pegues Scholarship (2003-2007). He successfully completed the Engineer-in-Training examination in Mechanical Engineering for the State of Louisiana. Becnel has been a graduate research assistant under Prof. Norman Wereley in the Smart Structures Laboratory at the University of Maryland since 2008. Becnel has been working on adaptive energy absorbers for crew protection systems, and will continue this work under NDSEG support. ?I?m really excited and honored to be given the support to pursue research that I?m passionate about and work on something that I think holds real promise in opening up access to space for the broader public. The opportunity to approach this challenge with a wide perspective, instead of focusing on a narrow element is really unique and could only happen with the kind of support the NDSEG fellowship offers,? said Becnel. ?I definitely think the expertise and experience of the faculty and researchers that I already work with in the Aero department played a big role in me receiving this fellowship.? Congratulations to Mr. Andrew Becnel for receiving the NDSEG Fellowship!